On behalf of Eire Og we would like to thank to everyone for the support received for our Development Draw. The draw was a resounding success and allows us to proceed in confidence with the development of our playing facilities and continue to serve the growing local community. Our thanks to all of the local businesses who sponsored the fantastic array of prizes, contributing greatly to the success of the draw. Thanks to our club members who gave freely of their time to sell tickets and promote the draw far and wide. Particular mention goes to the members of the Development Committee for their efforts over the past number of weeks and months. The success of the draw is testament to their hard-work and dedication over the course of the project. Finally, thanks to everyone who bought tickets and our congratulations to the lucky winners listed below. Go raibh maith agat go leir! 10th - His & Her iPad Minis - Jonathan Fitzharris, Co. Wexford. Eire Og is about to embark on a significant development project which will see a new sand/soil based pitch with floodlighting on site of existing main pitch, enhanced netting and fencing as well as provision of toilet facilities adjacent to fields across Casey's Road. 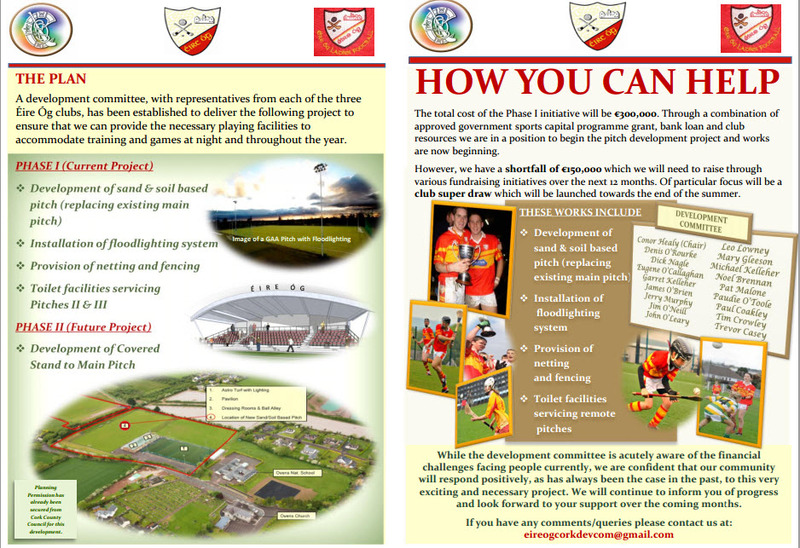 This is a very exciting project which will bring our facilities to a new and necessary level which will benefit all involved with Ãire Ãg and the wider community and requires the support of the whole community. Please see the brochure below which sets out the project in greater detail. 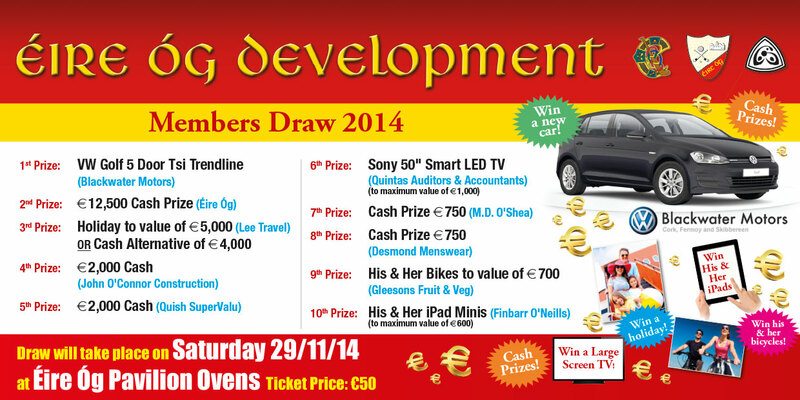 Thanks to all who supported the launch night for the club development draw which took place on Monday evening. The launch was well attended by club members and was a great success. Our thanks to the guest speakers on the night; Bob Ryan, Cork County Board Chairman, Michael Creed T.D., J.J. Long Muskerry Board Chairman, and An tAthair Liam Ã hIcÃ­ P.P. Thanks also to the recently elected local representatives who took the time to attend the launch and to Cork Senior Hurling Captain, Patrick Cronin who gave so generously of his time signing autographs, standing for photographs and passing on advice to our juvenile players. 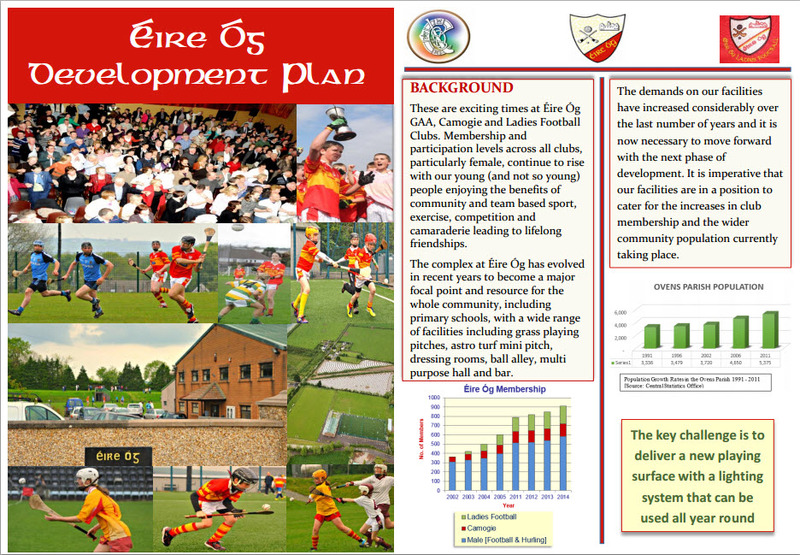 Development Committee Chairman, Conor Healy, outlined the main phases of the project, stressing the need for the development and the benefits that would accrue to Eire Og and to the wider community for this and for future generations. He also detailed the fantastic prizes on offer as part of the draw and thanked all of those who have donated prizes, in particular our club sponsor Denis Murphy of Blackwater Motors who has sponsored the top prize; a Volkswagen Golf 5 Door TSI Trendline. Club Chairman, Pat Malone, endorsed the development project and thanked the development committee for their efforts to date in preparing a detailed project plan and supporting documentation. He urged the members of the club to support the draw and to participate in the fundraising efforts. The draw itself will take place on Saturday, November 29th but we are wasting no time in progressing with our fundraising efforts so please get involved to help raise the necessary funds for this ambitious and much needed development. The success of the draw will be crucial to the next phase of our club's development and will benefit the entire community for years to come with improved playing facilities for each section of our vibrant, growing club. Keep an eye out on local media, club website www.eireogcork.ie and official social media channels for further news and updates. Ar aghaidh linn le chÃ©ile!